The problems of the world are really big. They’re awful and all-encompassing and involve all of us. I sign petitions, donate when I can, stay informed and try to not make choices that I dunno, badden things up. (I’m inventing phrases now, because creative). Nothing much changes. Or if it does, it is slowly by one child fed or bear bile farm closed at a time. Any way, the things sustaining me at the moment are my preoccupations with my creative writing thesis and fiction – in books and on TV. Am really enjoying Arrow (yes that Batman TV show except not with bats but with arrows). Ah DC Comics, I kinda wish a middle class or ‘poor’ person could become an avenging arrow shooting hottie one day, but there you go. Suffering billionaires are the perennial cool thang. Also finding Ripper Street quite entertaining for the main characters and their relationships and the now-quaint Victorian manners amid the barbarities. The other thing that makes for happy is Dr Who. It’s the kind of happy that sometimes means tears, but, happy. Happy because I am invested, that it’s managed to capture my imagination for since forever and still does. Happy because it is meaty enough to critique but also enjoy. Star Trek, again, was a while ago, but I was relativity happy for escapist fare about friendship, violence and cheekbones in space. Even if it lacked a bit in female agency vs the male gaze equation. Happy to be looking forward to (the legend that is) Sherlock Season Three, The Hobbit Take II and whatever is next in Avengers-world. I am grateful for Pintrest’s endless memes about cats and ‘geek’ things to keep me amused, and for its history pages and endless other categories keeping me inspired. I’m grateful for Twitter. For the witty asides, for finding like-minded souls. And for the protesters and innovators and public speakers doing brave things against all the isms – sexism, racism, extremism, etc-ism. And finally for all the creators out there, writing and painting and performing, you all inspire me too because you get up and do. 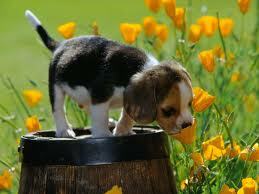 Random image of puppy in flowers. In a round about way I’m trying to say that I need these happy things to shine lights in dark corners and to sustain me because I’m exhausted. I desire upliftedness – like puppies romping through fields of flowers (see above), but the web (at times), the media, this world can be so full of hate and jealousy and ignorance (those isms). From kids being gassed in Syria, to fuckers dancing on dying elephants and whatever is going on in Australian politics – that happy things are difficult to see. It’s why I need stuff I like to be better. It’s maybe why we all need the artists and writers and film makers and creators of any kind to be better. We need stories to pass the Bechdel test for instance. We’re in a dire place and lots of the time the suffering is white noise. But we can find, I don’t know, solace maybe, in stories, in art, in achievement. The point is when someone imagines there can be some sort of freedom, or that a person (female or male) can overcome the odds, or show us the truth of ourselves…then that creative thing must work on many levels and be inclusive, or else what is the point? This is why I can’t dismiss pop culture, this is why I will continue to critique it. It’s why, for FFS, it is called popular culture.